Adidas And Polar's Integrated Training System | OhGizmo! By David Ponce on 10/13/05 • Leave a comment! This little watch is going to be part of an interesting “Integrated Training System” being cooked up by a collaboration of Adidas and Polar. It’s set to be launched early 2006. The gist is this: special fibers woven into your shirt will be able to precisely monitor your heart rate. 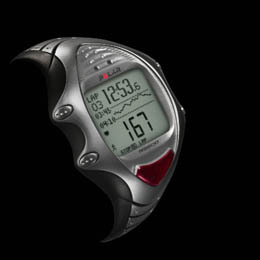 Then, through the tiny Polar WearLink connector that you attach to the front of the shirt, you can wirelessly transmit this data to your watch (the Polar RS 800™). There is also a shoe, the AdiStar Fusion, that has a strategically placed cavity in the midsole which can house the very light Polar s3™ Stride Sensor, making it easier to use, more comfortable and more consistently accurate than top-of-shoe systems. All the data being sent to your watch can be analysed on the fly, or downloaded to your computer for deeper scrutiny. The whole system is expected to cost about $640, though you can also purchase it in separate parts. Check out the website.